Our homes are the nests that we must keep warm and cozy for our families. As a mother, grandmother and wife, I consider it an honor to make our surroundings as beautiful as possible. Our homes seem to sparkle and take on new life during the holidays. Families come together in anticipation of the celebration—the excitement grows with each day. Table decorations are particularly fun at this time of year. The favors all wrapped up, the beautiful napkins carefully tied in satin with bells, the candles that flicker, the special flowers stuck into the evergreen, the glass balls glistening, and the china and silver so carefully stored is all brought to the table to show how we honor our families. The little ones will remember these times as we create new memories and show our love as we cook special dishes with family recipes and listen to each other reminisce of Christmas’s past. 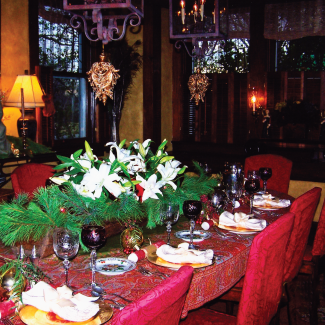 Our favorite Christmas table was using an antique paisley cloth and antique gold chargers from Nachez. The crystal is Pairpoint and is the same age as the house—1898! The favors are glass balls with a sprig of greenery and berries on a ring of berries. For the centerpiece, an antique pig trough was used with greenery, large mercury balls and white lilies. Poppers were put at each place for fun. One of my special tables was a luncheon for a bride that was going to Tahiti for her honeymoon so I did red orchids for the centerpiece and tied the napkins with bear grass. Instead of vases, we made a bamboo frame wrapped in leather to give a tropical feel. Each guest received a silver ball in a velvet box as a favor. Inside the ball, the bride wrote a special note to each guest. Have fun with your table. No matter how elaborate or how simple take the time to make it special. I love to put questions in the napkins for people to have to answer. That is great for conversation! Or you can come up with riddles for Christmas- just be creative and put thought and time into your holiday table. Then you will be making memories. Honey Minshew is the owner of Petite le Fleur in Sherman, Texas. She and her husband, businessman and attorney, Robert, own and operate Kelly Square in Sherman. The story of Christmas can be told through your table decorations and what a lovely way to talk about all the symbols’ relationships to the holiday. Your table can reflect the contrasts between the simple life from where Jesus came, to the royalty He is. A simple wood table signifies a simple life. Paisley fabric denotes royalty. Paisley was first in Persia for the kings and takes us to a far off place. A wooden pig trough represents the lowly manger and the animals of the creche and Jesus birth. Three red balls represent the Three Wise Men. They also are the Father, son and Holy Spirit. The color shows the sacrifice that was made for us all. The reflection we see is Christ in us. Evergreen used signifies a sign that winter would end and new life would come. Wine served reminds of communion and new life for us. White lilies show the new life that is given at Easter. Gifts remind us of the first gifts of the wise men. Tinsel on the table follows a legend that parents trimmed the tree while the children slept and spiders came to see the tree, leaving cobwebs all over it. The Christ child came to bless the tree and the cobwebs turned to gold. Stars led The Wise Men to Jesus that special night of nights. Bells ring to tell us of His Birth.